Biological pesticides based on nucleopolyhedroviruses (NPVs) can provide an effective and environmentally benign alternative to synthetic chemicals. On some crops, however, the efficacy and persistence of NPVs is known to be reduced by plant specific factors. The present study investigated the efficacy of Helicoverpa armigera NPV (HearNPV) for control of H. armigera larvae, and showed that chickpea reduced the infectivity of virus occlusion bodies (OBs) exposed to the leaf surface of chickpea for at least 1 h. The degree of inactivation was greater on chickpea than that previously reported on cotton, and the mode of action is different from that of cotton. 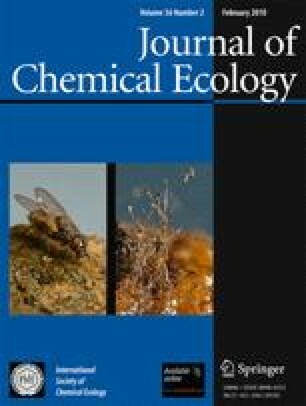 The effect was observed for larvae that consumed OBs on chickpea leaves, but it also occurred when OBs were removed after exposure to plants and inoculated onto artificial diet, indicating that inhibition was leaf surface-related and permanent. Despite their profuse exudation from trichomes on chickpea leaves and their low pH, organic acids—primarily oxalic and malic acid—caused no inhibition. When HearNPV was incubated with biochanin A and sissotrin, however, two minor constituents of chickpea leaf extracts, OB activity was reduced significantly. These two isoflavonoids increased in concentration by up to 3 times within 1 h of spraying the virus suspension onto the plants and also when spraying only the carrier, indicating induction was in response to spraying and not a specific response to the HearNPV. Although inactivation by the isoflavonoids did not account completely for the level of effect recorded on whole plants, this work constitutes evidence for a novel mechanism of NPV inactivation in legumes. Expanding the use of biological pesticides on legume crops will be dependent upon the development of suitable formulations for OBs to overcome plant secondary chemical effects. We gratefully acknowledge the Higher Education Funding Council for England for funding and the generous advice and assistance of Prof. David Hall, Dr. Geoffrey Kite and Dudley Farman in the chemical analysis.